Allpress is a well-known name in the UK speciality scene. 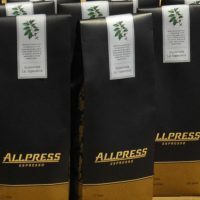 As well as attending numerous coffee festivals (London Coffee Festival, World of Coffee and Manchester Coffee Festival in the last year alone), Allpress supplies coffee shops up and down the country, from the lovely Kalm Kitchen in my home town of Guildford to the likes of Edinburgh’s Castello Coffee. The backbone of the company is the ubiquitous Redchurch blend which accounts for the bulk of Allpress’ output. This is joined by a second espresso blend, Three Bells, a decaf and a pair of single-origins (currently a Kenyan and a Guatemalan) roasted for filter. And that’s it: no bespoke blends for select cafés, no single-origin guest espressos and no extensive range of filters. Allpress believes in doing a few things and doing them exceedingly well. While others strive to extract the very pinnacle of the coffee’s flavour, requiring precisely-timed shots on perfectly-calibrated equipment, Allpress aims to provide a robust, well-rounded espresso which will reliably pull a good shot on a range of equipment under all sorts of conditions. To me (and these are definitely my words, not those of Allpress), Redchurch is the workhorse of speciality coffee. Whenever I visit somewhere serving Allpress, I know that I’m going to get a solid cup of coffee. It might not excite everybody, but up and down the country, that’s exactly what a large part of the speciality industry needs. I toured the roastery with Dani, who, for the last 18 months, has been nagging me to suggesting that I visit. In many ways, Dani epitomises Allpress; an Aussie from Sydney who has made her home in London, she joined Allpress a few weeks after it opened. Initially working as a barista, she moved into training and is now in sales. All 50+ staff in Allpress are expected to be able to do everyone else’s job, be it answering the phones, training customers or pulling shots. The roastery is state-of-the-art, with a custom-built 70kg roaster which uses heated air rather than a rotating hot drum. This has many advantages, not least its environmental impact, using far less gas in a week than the 30kg Petroncini roaster it replaced at Redchurch Street. The whole system is impressive, with manual handing minimised at every stage. Having seen roasters haul 30kg coffee sacks up flights of stairs or manually bag hundreds of 1kg bags at a time, I can appreciate the value of this, particularly when there’s a 70kg roaster going nine-to-five, five days a week. Allpress sources many of its green beans directly, using the economies of scale of roasting around the world. Although there are similarities between each country, each Allpress operation does its own thing. For example, Dani told me that the UK roasts the lightest of all four countries, testament to the growing Scandinavian influence on the British coffee market. Like Aussie-imports, The Roasting Party, Allpress puts a strong premium on working with (and looking after) its customers rather than just selling them beans. It holds regular barista days which it encourages its customers to attend. As well as technical sessions, attendees get to roast their own coffee (and drink it), with everything rounded off with a barbeque at the end of the day. I wonder… do coffee bloggers count as customers…? This entry was posted in East London, Meet The Roaster, Roastery and tagged Allpress, include by Brian Williams. Bookmark the permalink.